We stock a large range of disco lighting available across London & Surrey! We have packages which are suitable for any occasion – whether you’re planning a big budget event or for those looking to create a great party atmosphere without breaking the bank! Mirror Balls are a great add on to disco lighting as they really set the mood and have become increasingly popular. We also provide smoke/haze machines which add to the effect brilliantly by highlighting the beams of light. Looking for a sound system to go with this? Look no further – we also stock DJ Booths and iPod systems which are easy to use and plug straight into an iPod or laptop to play your favourite party tunes. 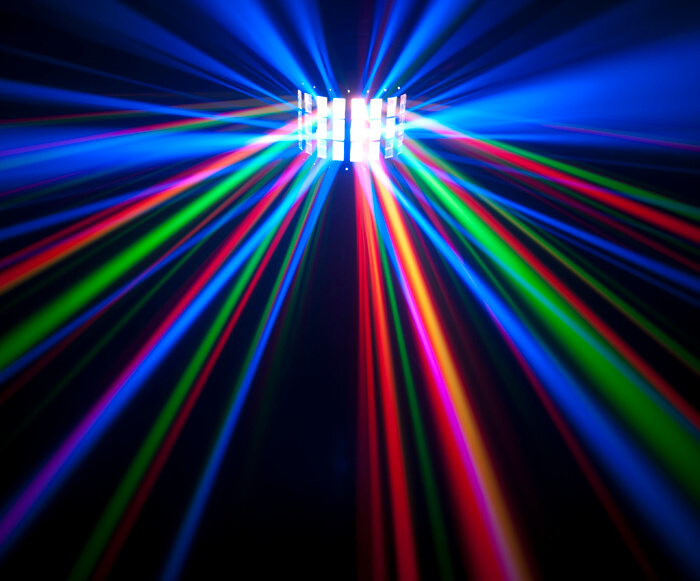 We supply the latest LED technology for those looking to dry hire disco lighting. This makes it very safe for use around small children at a house party (they also use less electricity)! Whether you are looking for something simple, such as 2 lights on a stand, or a full-on production for a party – we can help! Each quote is bespoke sue to the amount of lighting you may want and any extras you may need such as stands and/or cable controllers – don’t forget we can also supply the sound system. As with all our equipment, you have the option to Dry Hire (this is a good option for more experienced users who feel confident setting up sound/lighting equipment themselves) – alternatively, you can choose to have it delivered, set up and dismantled at the end of the night by our experienced Crew.